When Lottie Pye died at the age of 108 she left her whole collection of thousands of photographs to her son James, who she hadn’t seen in almost 80 years. When James happens upon Jenny Jones, a University student studying photography, he decides to let her go through them and catalog them, never realizing that this could finally be a way to get to know both his mother, and himself. 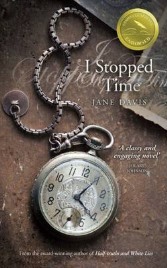 This is Jane Davis’ novel I Stopped Time. I just adore strong female characters, especially those who find their own paths, even if that causes them problems. Lottie Pye is just that type of character – a woman ahead of her time, unwilling to be confined by the dictates of society, even if that causes problems for her or others. In this case, she ends up having to abandon her son – partially to get away from her emotionally abusive husband in London, and partially to return to her making her own life in her home in Brighton. Her son, on the other hand, isn’t quite so resilient. His political career ended in disgrace and seemingly without much of a fight. So it isn’t surprising that the pub waitress/university student Jenny Jones can manhandle him into accepting her amateur psychoanalysis of his mother through her photographs, and through them, all of James’ apparent mistaken impressions he had of her. Of course, this makes quite a bit of sense considering he only recalls meeting his mother once, and despite his father never having anything bad to say about her. And so, the relationship between James and Lottie ends up being very complicated both because of and despite the dismal lack of contact. Davis tells their stories in parallel, switching between Lottie’s story that starts in 1910 and shifting every so often to James’ story in 2009. This is a literary mechanic that isn’t at all unique, but Davis uses it to its best advantage. Of course, the parts of James’ story are fewer and further between because they span less than a year, but Lottie’s story spans almost a full century. In this way, Davis uses James’ story more to fill in a few of the blanks of Lottie’s life than actually develop James as a central character. Personally, I found this to be the only aspect of the novel that didn’t sit quite right with me. I would have liked to have gotten to know James a little bit better than what Davis gives us here. Other than this small drawback, I Stopped Time has a whole lot going for it. The writing is honest and straightforward and the story is totally compelling. Davis doesn’t pull any punches despite a few twists along the way that will raise an eyebrow more than evoke surprise, but also keeping you turning the pages. Despite the enormous timeline included, Davis has pared down the action to highlight only what is necessary to the character and plot development, and eliminating anything maudlin that two World Wars could easily have inspired. Kudos to her for that, since I can think of several writers who tackled far less than a century of action and still ended up giving us totally bloated and sickly sentimental novels. More importantly, Davis infuses Lottie with so much richness you might wish that some of Lottie’s fictional photos were included as a supplement the story. In short, Jane Davis’ novel I Stopped Time is an artfully crafted character study that straddles the contemporary and historical fiction genres with grace and aplomb, while combining the best of both literary and women’s fiction. I’m highly recommending it and giving it a full four stars out of five. I Stopped Time by Jane Davis was originally published December 21st 2012 on Kindle and was re-released in May 2013 by CreateSpace Independent Publishing, and is also available via Smashwords. My thanks to the publishers for sending me a review copy. No Comments on "I Stopped Time"